The design of KZK White Line capacitors is a lot more complicated than the design of Asian or European brands. Technological processes that considerably increase the characteristics of the capacitor against the background of analogues of other manufacturers are applied. The capacitor is coiled with a polypropylene film with aluminium spray. Aluminium is sprayed with zinc. 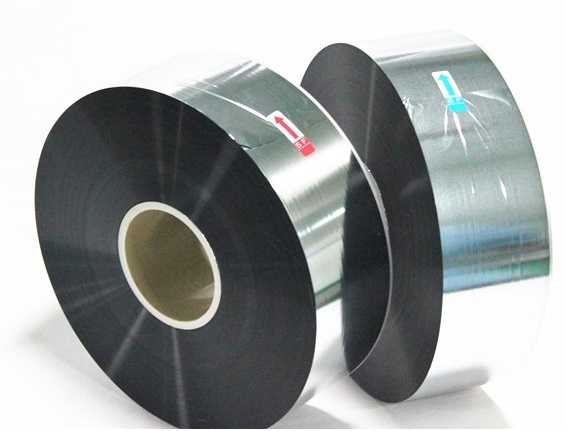 Zinc performs two functions: protects aluminium from oxidation, heavies the film, preventing the appearance of resonances (the specific gravity of zinc is 7 g / cm3 comparable to copper 8.92 and more than 2 times the specific gravity of aluminium 2.7 g / cm3). Metal is deposited on the film unevenly, a thicker layer (a tubercle) is deposited on one of the edges. The second edge, on the contrary, is practically not covered by metal. This is very important, since in the future this thickening will shorten the turns of the roll and thereby shunt (close) the parasitic inductance. It should be noted that two types of film are used to produce one capacitor: the left (with a thickening at the left edge) and the right one (with a thickening at the right edge). A roll of the capacitor is formed of the two films, at the optimum tension. The choice of tension is very important when winding a roll of the future capacitor, since very strong tension can damage the metal on the surface. Damage to metal on the surface of the film, the appearance of microfractures, will lead to an increase in the parasitic resistance and capacitor inductance. A low film tension leads to a higher consumption of the material and, as a consequence, to an increase in the parasitic internal resistance. When the tension is low, a loose roll turns out, which becomes very sensitive to external vibration (microphone effect), because during vibration, compression / expansion of the roll and, as a consequence, a change in the capacitance of the capacitor will occur. Changing capacitor capacitance will not only cause noise on the main signal (which is not so critical as the main signal is much larger in amplitude), but also modulate (distort) the main signal. A loose roll can also have a whole spectrum of parasitic mechanical resonances that will be excited from external vibration and from flow through the current capacitor (self-excitation effect). 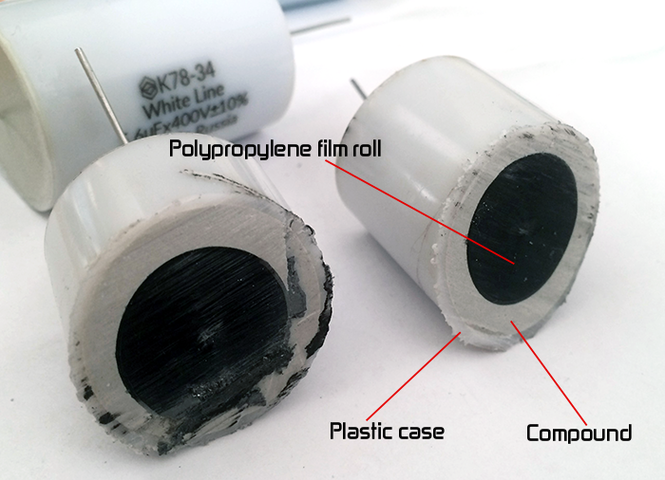 The finished roll of the capacitor is covered with contact glue (from pane ends), which, due to the thickening of the metallization on the edge of the film, shunts (closes) the turns, thereby significantly reducing the internal parasitic inductance of the capacitor. But since the thickening on the films is on opposite sides, the capacitor itself is not closed. Due to the fact that the film has undersized on the opposite edge, the leakage current at maximum voltage values remains negligible. It is worth noting that manufacturers of cheap capacitors do not use conductive adhesives, since they cost much more than the film itself, from which capacitors are made. Such savings can reduce the cost of the capacitor, but it makes it unsuitable for audio. The maximum that manufacturers of cheap capacitors usually make, is connecting the beginning and the end of the film. During the application of conductive adhesive, the leads are installed. Correct installation of the leads ensures low internal resistance of the capacitor. In the KZK White Line, the designers provided a large contact patch with the conductive adhesive, which reduced the internal resistance. The assembled KZK White Line capacitor is inserted into the plastic case. The housing on one side is filled with a compound (adhesive / sealant). And it is filled only up to a roll of the capacitor. This is necessary to fix the roll of the capacitor in a position where it does not touch the inner walls of the housing. Then, on the other side, the housing is filled with a compound, first the gap between the housing and the roll, and then to the edge of the housing, protecting the roll, the conductive adhesive and contact with the terminal. This approach makes it possible to provide an unprecedentedly low microphone effect, since the capacitor itself does not touch the walls of the case, it is covered on all sides by the compound. It is worthwhile to note that manufacturers of low-cost capacitors often abandon the case, by packing the capacitor in a film, the maximum that they can do is to protect the leads from the with the roll by the compound. 7. A ready for use capacitor is tested, the deviation of the parameters from the nominal value is checked. Laser marking is affixed. TO PURCHASE KZK WHITE LINE , PLEASE CONTACT US DIRECTLY FOR QUOTATION OR VISIT OUR EBAY STORE. WE SPEAK ENGLISH AND RUSSIAN.